1. 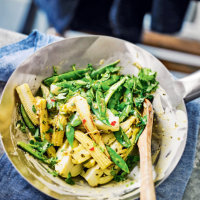 Heat the oil in a frying pan and fry the baby corn and sugar snaps for 2 minutes. Add the ginger, pak choi and 2 tbsp water, cover and fry for a further 2 minutes. 2. Stir in the sauce with a further 2 tbsp water and cook for 1 minute to heat through, sprinkle over the coriander and serve.